I hike. On one of my favorite walks, along the Buckeye Trail in Hinckley Reservation, the path skirts the edge of a field adjacent to woods. 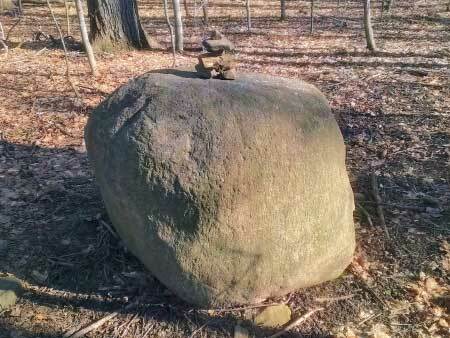 Usually there is a cairn (man-made pile of rocks) there. 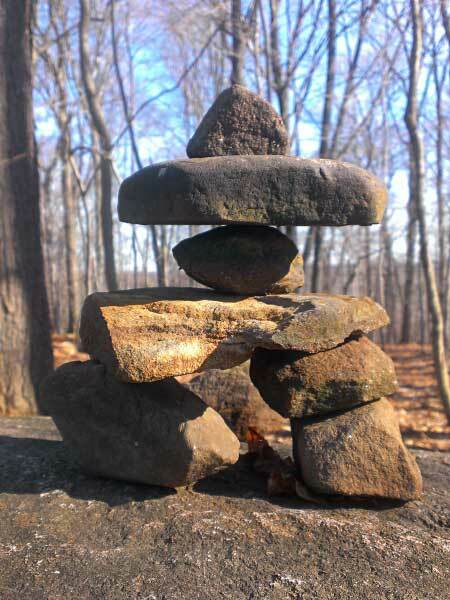 For the first 6 months, the cairn was unchanging, but then – it had been knocked down. I was sad. Speaking of perspective, when I step back – waaay back – here is what it really looks like. 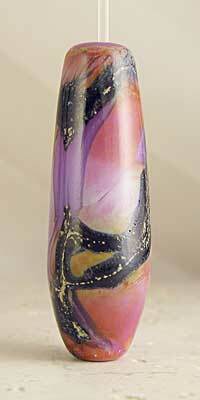 Rosemarie Hanus makes beads, but not rock cairns in her home studio. See these beads at Etsy, Art Fire, or her Spawn of Flame website. 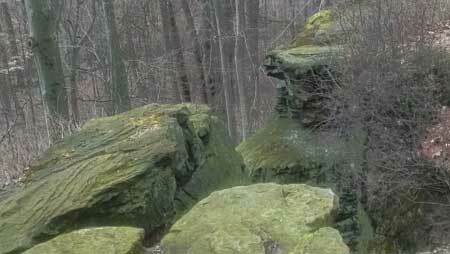 There are many ledges in Northeast Ohio thanks to ancient glaciers. They pushed rocks along as they moved; when they melted, the rocks remained. 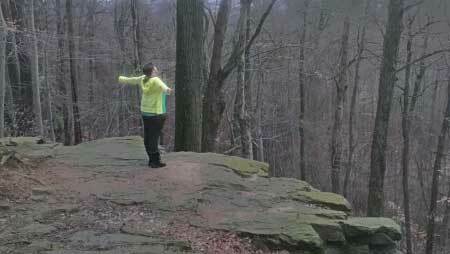 We took advantage of freakish warm weather here in our January winter and hiked the local Top O Ledges, part of Hinckley Reservation. The dog was quite happy. He has spied… something. 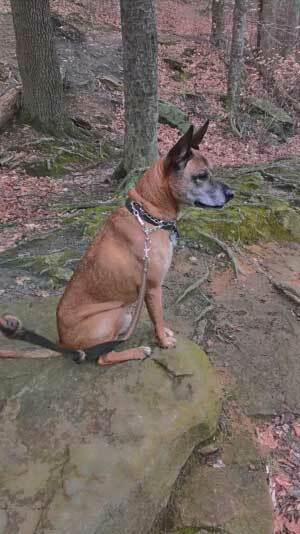 Here is another gratuitous ledge photo. Once again I was looking at some of my designs that I don’t make anymore. 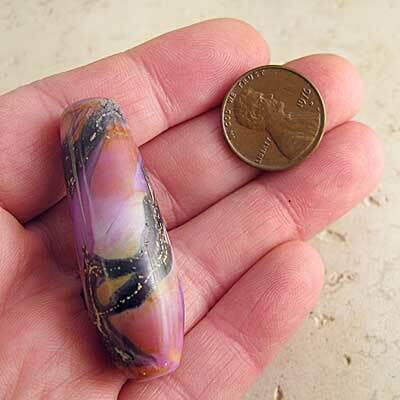 One is a beautiful bead called Purple Majesty. Just as with a cooking recipe, sometimes changing one ingredient gives a totally different result. This time, the background is more pink than purple – and the funny thing is that the background color was the one that was the same. 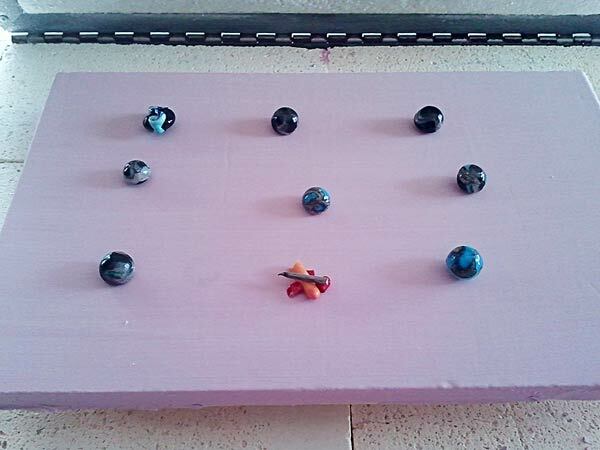 Today, I am going to make some cabochons. Well I’m going to attempt to make some anyway. 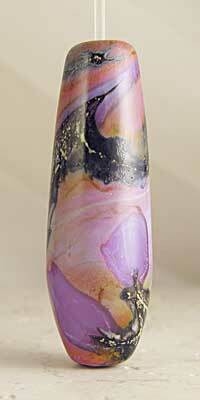 At least 2 years ago, my friend Linda gave me some kiln wash to do some fusing. I was fearful. Of what, I am not sure – maybe of breaking my kiln somehow. So right now, I have some test pieces in the kiln and they are ramping up to slump. I was wondering how I would tell that I got full coverage with the kiln wash. The kiln wash is pink! It was easy. We did a little of both. Our first loop on the Plateau Trail took us to Meadowedge Pond. 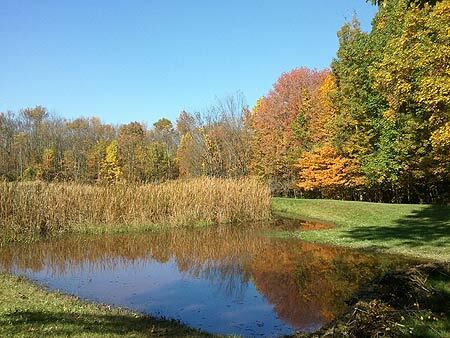 You can see where the pond used to end – where the tall grasses are. Somebody (beavers, likely) built a new little dam, extending the pond a little. You can see just a little of the dam in the lower right corner of the photo. 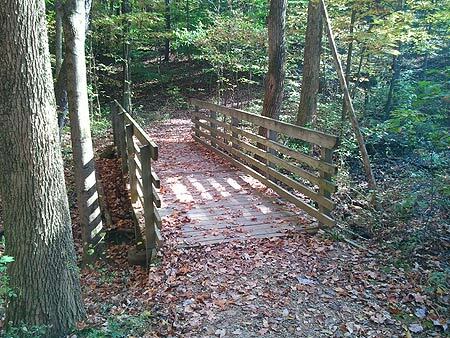 Although it is not a challenging trail, it has many beautiful passages – such as this little footbridge over a tiny ravine. 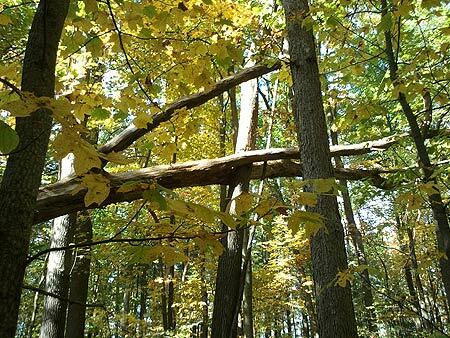 Check out this fallen tree – suspended in the air. I am looking forward to going back and exploring more of the Plateau loops. Here too, there were neutral backgrounds with bright splashes of attention getting color. Smithsonian Background gray – green tint? 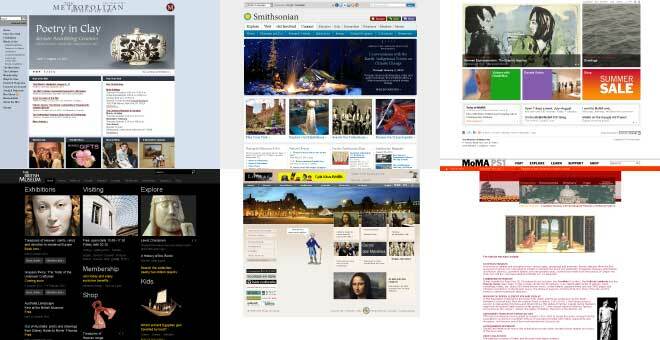 Lots of bright pictures, blue nav tabs with white font. Some Blue nav fonts also. MoMa – Museum of Modern Art – white background, black navigation font, changing blocks with info – bright colors, with a orange sign in bar at the bottom. Louvre – – White background, with peach fade to gray info area, black and brown fonts. Well, it seems like the thing to do is design something very neutral. That makes sense, since I wouldn’t want to detract from my glass items anyway. Here’s where I want to argue with myself. I want business cards with color – preferable matching my ArtFire and Etsy shops, but I don’t want a bunch of beads scattered about. I decided to make a gradient, with just one set of beads. It turned out much more colorful than I intended. The orange was supposed to be muted! Because the banner was so bright, I ended up setting the background of that to a brighter orange. I think I still have work to do! Recently, ArtFire made the announcement that it was going to be changing the look of everybody’s shops. As a part of this, we would need to develop a new header with a different size. In addition, we had control over more of the colors in the shop than in the past. I thought that this would be a good time to do some research to help me decide on the color scheme to use. Currently, I have different colors in my different shops – not such a good idea for branding, right? I got the idea to look at luxury brands and see what colors they use (because my beads are luxury brand, of course…) I found an article at Forbes that listed the top luxury brands. 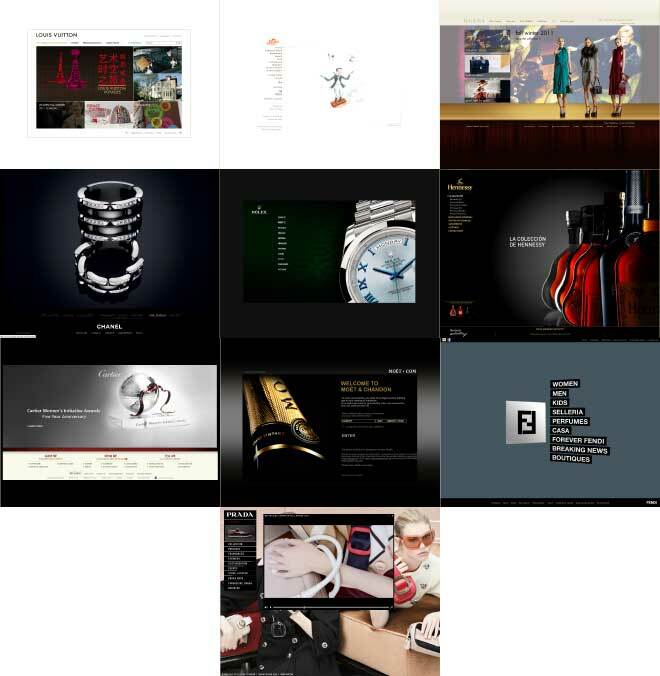 #7 Cartier / Black background, white nav bar, neutral brown/gray font, splash band of deep red. 10 Prada , a background image of a runway show area, popups of mostly black with white lettering. OK. I see the pattern – very little color to distract from the products. But!! I’m an artist! I want color!! What to do??!! Tomorrow, I’ll show you where else I looked.